The role of marketing has shifted from art to science, and nowhere is that more visible than in these interviews with CMOs who are not just creative thinkers, but heavy technologists. If you want to be a marketer of the future, rather than the past, this book will show you where the top marketing minds see things going. In marketing, it seems that everyone wants to talk to, sell to or become a CMO. But, most don’t understand what it takes to succeed at one of businesses’ most challenging roles. Josh brings you inside the inner walls of the C-Suite, introducing you to some of the world’s top marketing leaders to help you gain insights and secrets that will guide your future. 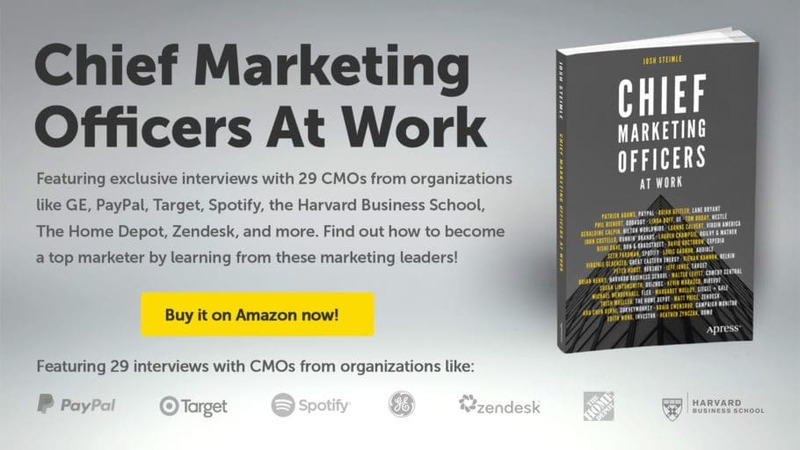 Chief Marketing Officers at Work is an easy-to-read, yet substantive book that explores the Who, What, Why, and How they got there of a number of leading CMOs. Anyone considering becoming a CMO, or those already in the role, will find great value in the feedback offered by these luminaries and should definitely read it. What does it take to run a successful marketing campaign? What is one of the biggest mistakes you see CMOs today making? How do you build and manage a great marketing team? With interviews conducted by Josh Steimle, author of over 200 articles in publications like Forbes, Time, Inc., Mashable, and TechCrunch and founder of digital marketing agency MWI, this book is a must-read for all C-level executives and others who interface and collaborate with marketing departments. Trends in digital marketing, analytics, and marketing automation have pushed marketing to the forefront and increased overlap with business functions that were previously viewed as separate and distinct from marketing. Today, marketing directly influences sales, HR and recruiting, customer service, operations, and technology, requiring individuals in these roles to better understand how marketing works and how it can help them achieve their objectives. Who Should Read Chief Marketing Officers at Work? CMOs, other marketing executives, and aspiring marketing executives. Advertising execs, media planners, public relations professionals, digital marketers, and other marketing professionals. Advertising agencies and marketing and PR firms. All others who interface with marketing functions in their own roles.